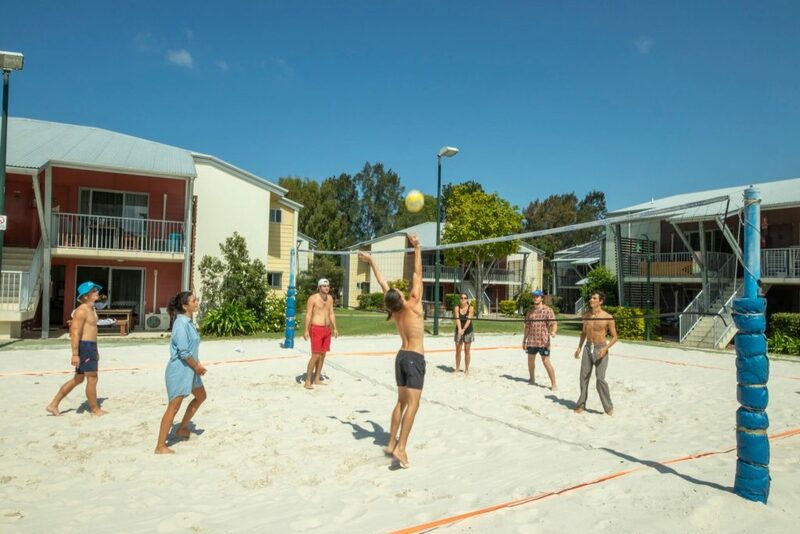 Located on the Sunshine Coast, Varsity Apartments is purpose-built for students, to be a fun and safe place to live and study. Residents of Varsity Apartments may choose to get fit by doing laps in the lap pool or feel like lazing around at the resort pool and tanning deck. Each pool has shower and toilet facilities and is perfect for those hot summer days. 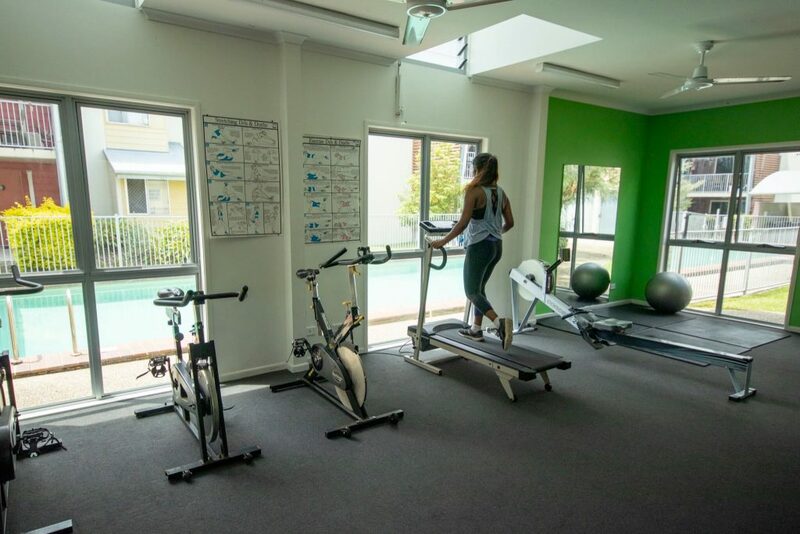 Take advantage of our fully equipped gym on the complex – no gym joining fees when you live at Varsity. Choose from a cardio or weights workout or maybe a session in the mirrored stretch area for any yoga fans. No excuses now. Got a group of mates who want to get active? Why not hit the beach volleyball court! Suitable for both small and large numbers of people, the beach volleyball court is a great place to get fit, have some laughs and meet some new friends all while having some fun. 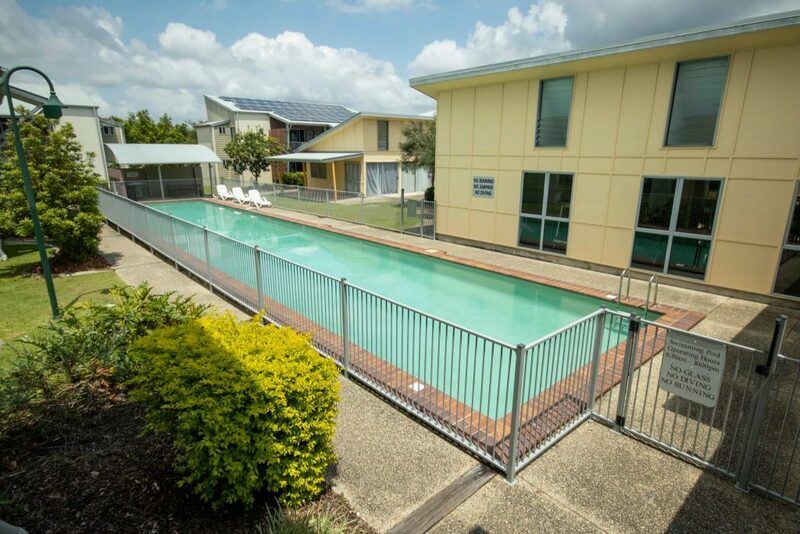 Our Sunshine Coast Uni accommodation definitely isn’t boring! 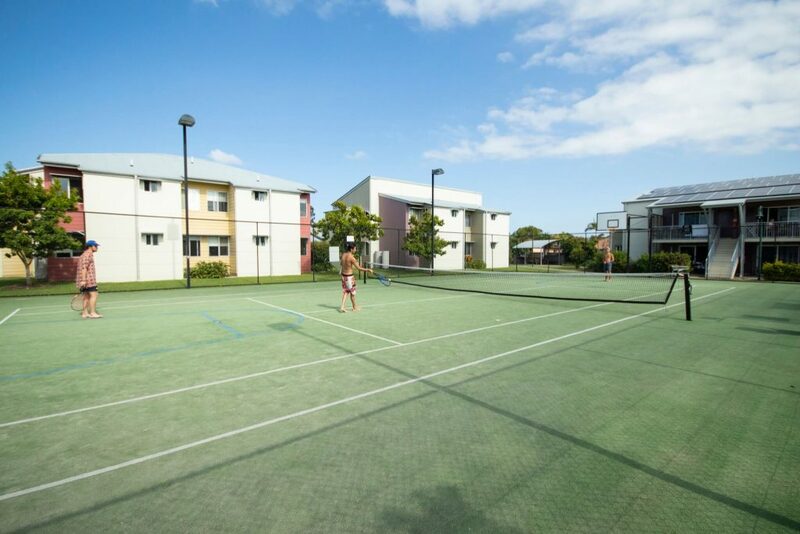 Students are encouraged to flaunt their tennis and basketball skills, or just have some laughs with their mates day or night on the synthetic grass tennis and basketball court. The court is both a full sized, fully line marked tennis and basketball court and is lit by overhead lights. All tennis equipment is available at the office for you to borrow. A Function Room and Games Room is provided at Varsity Apartments for resident use and enjoyment. The Function Room, located beside the resort pool, is equipped with a 65″ Smart TV and pumping sound systems plus blue-ray DVD player. Complete with pool table and ping pong set – you’ll be able to host anything in there! This equipment ensures that residents at Varsity Apartments are never left with nothing to do! The function room also has vending machines to allow residents to fix those hunger pains or purchase a cold drink on a hot day. For those Aussie students wanting a good old-fashioned Aussie BBQ (and for the international students who want to experience one), three separate BBQ areas have been provided at Varsity Apartments. The electric BBQs are provided with tables and seating, allowing groups to entertain friends comfortably. The BBQs are located near the lap and resort pools as well as at the rear of the complex for those seeking a more private and quiet dining area. Your security is important to us, and Varsity Apartments was built to be a safe place for students to live and study. We have Security Guards who patrol the complex after office hours and through the night. There’s always a Varsity staff member available to contact and on-site – that’s 24 hours a day, 7 days a week. Our security guys and gals are your point of contact after hours, and provide security for the complex. It’s free to call them from your room telephone. To aid in keeping the complex a safe place, photo ID cards have been introduced. At the beginning of your stay we will issue you a photo ID card. After-hours visitors are to be signed in at reception after 6pm if they intend to stay later. Students are only permitted to have one overnight guest per week. Any extra nights can be charged at $25 per night. Visitors are permitted to stay in the complex until 12am without being charged and are to be signed out by the student when departing Varsity. Whether you love playing games, stream your lectures or like to stay up to date instant messaging with your friends overseas – these great plans are your solution. Varsity Apartments offers tailored internet plans for students’ needs in partnership with Cirrus Communications. Once you have signed up with Cirrus Communications take advantage of the WiFi hot spot by the Resort Pool. If you need to top up your 10GB package, Cirrus offers excellent value, easy to access packages. Just log onto your account and pick from the following options. We always like to remind our international students that Australia has a slower internet speed at a higher price than you may be used to. The Australian government is currently working on a better solution via the National Broadband Network.